Wild salmon are the foundation of the B.C. coast. Witnessing their life cycle from various perspectives throughout each year has given Tavish an intimate understanding of Pacific salmon. Knowing salmon from the perspective gained as a commercial fisher, researcher, subsistence fisher, eco-tourism leader, underwater videographer and fascinated naturalist has provided many unique opportunities to document these precious fish that feed our coast. A collection of Tavish's favourite images witnessing the unfolding lives of Pacific salmon. Fine art prints are available. 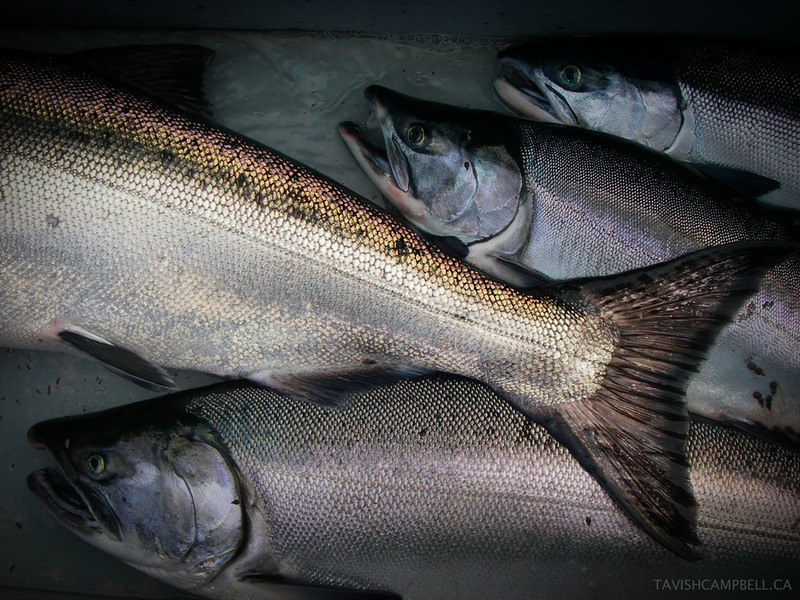 People protect what they love, and salmon have always been an integral part of Tavish's life. It has only felt natural to use his voice as a mariner, diver, and fisher, combined with his skill set as a photographer and videographer, to immerse himself in the conservation of wild salmon. Pacific salmon face many looming threats such as the salmon farming (aquaculture) industry, LNG proposals on the coast, climate change, habitat loss and degradation, and more. Tavish's work helps to shine a light on these threats and to inspire action to protect the foundation of the coast - wild salmon. A tiny chum fry feeds in the protected waters behind Lelu Island, Skeena estuary. If approved, a proposed LNG port would destroy this critical rearing habitat for multiple Skeena River salmon species. The controversial aquaculture industry raises a foreign species of salmon on the B.C. coast - Atlantic salmon. Serious threats from the industry include foreign disease and virus transfer to native Pacific salmon, high levels of sea-lice from the salmon farms transferring to juvenile salmon smolts migrating past the farms. With salmon farms operating in the waters around his home, Tavish bears witness to the impacts of the industry on the migrating wild salmon that travel through his backyard. With a threat so close to home, Tavish has been involved in research and documentation of this issue on the coast for a number of years. Learn more and get involved to save wild salmon. Wild coho, chinook, pink and sockeye salmon caught on a small-scale family fishing boat off Haida Gwaii. 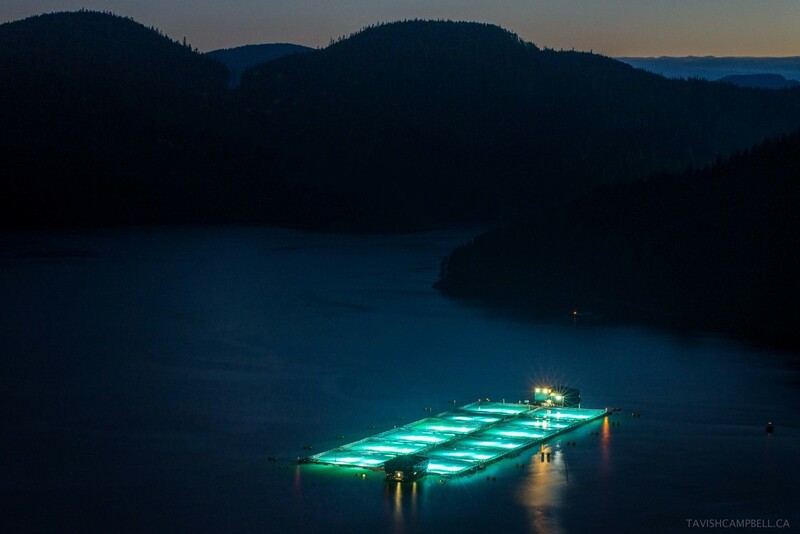 Venture Point fish farm - one of many in B.C. owned by Norwegian company Cermaq. Massive lights illuminate the water to increase “daylight” feeding hours. Even though this destructive practice is illegal in Canadian commercial fisheries due to it’s effectiveness at attracting marine life, the salmon farming industry continues to employ it. With only net separating the Atlantic salmon from the outside waters, there is no way of stopping countless species, including Pacific herring, from entering the pens to be eaten. Open net cage salmon farms must be removed from our waters. Fragile wild salmon smolts are captured briefly to test for sea lice and disease during the spring out-migration in the Skeena Estuary. Brent Island, Okisollo Channel. Ground zero for disease transfer to migrating Fraser River sockeye smolts. Lake Babine sockeye smolts are captured in the Skeena estuary during a tagged fish recovery study.